The National Cricket League, Inc. (NCL) is proud to announce the 1st National Cricket League - 2019 in Milwaukee, WI from July 4th - July 7th, 2019. 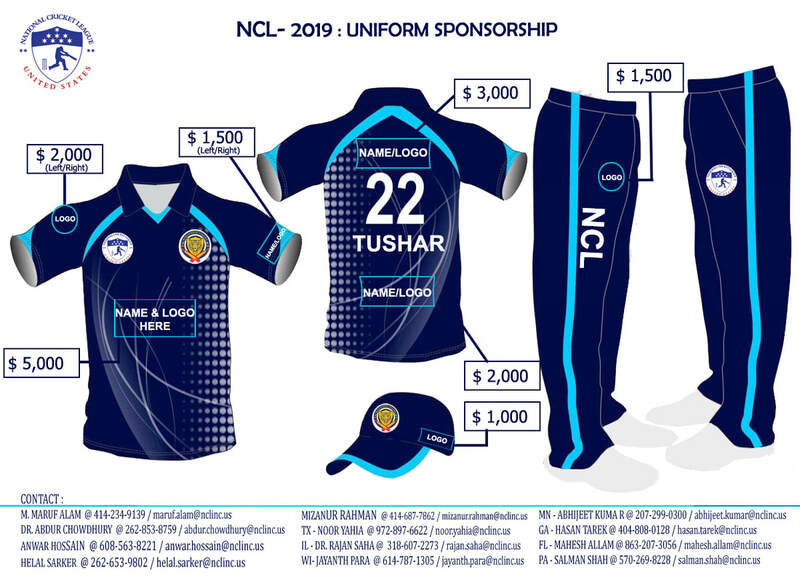 The NCL is a national level cricket league in the United States, featuring numerous opportunities for sponsors and advertisers. The League would include state level teams with the best available talents from their respective states. As these teams would be organized and/or sponsored by cricket and community leaders, it would attract the attention of a fast-growing cricket community across the country. This would provide an excellent opportunity for league sponsors to reach out to a growing diaspora for promoting their brands, products and services. Six sponsorship levels (Platinum, Gold, Silver, Bronze, Partners, and Friends) are available. Each sponsorship has related individual benefits shown in the following chart. • choose from innovative sponsorship that ensure the company’s brand is recognized and remembered. Logo and company information / Personal profile will be published in NCL’s official website. Once you select your sponsorship level, or would like to receive additional information, please contact one of the following individuals.